So your pastor preaches on giving? Thank him! He’s giving you some important news about one of life’s greatest secrets. A pastor who invites members to tithe invites them into a life-changing, soul-transforming experience that affects every area of their lives. In truth, it’s unfair to you if he’s not teaching you about this principle that’s changed history in ways we’ll never completely know until we get to heaven! So here’s the short list of reasons you should be giving a tithe (10% of your income) to your local church. If you want to teach your kids the best way to handle money and to be financially responsible, teach them about the tithe. Tithing has taught me how to avoid the virus of materialism and learn the bliss of generosity. A young adult tried to convince his 86 year old grandfather that he really didn’t need to worry about tithing because he wasn’t really making any money and was living on very little. The grandfather replied, “Why would I want to give up doing the one thing that makes my life have meaning and purpose?” He knew that the once you begin the journey of generosity and tithing Go will carry you through and enrich your life far beyond any money that you hold on to. When you tithe, you’re taking care of the facilities of your church, the minster(s) and their families. If your church gives through the Cooperative Program you are a solution to ministries and missions all over the world. Throughout scripture, God is continually testing those who follow him. Across the pages, we see men and women struggling with a God who dares them to trust Him a little more every day. But there is one area of our lives where God invites us to test Him. It is in this thing called the tithe. He says, “Test me! I dare you! I will come through.”It’s also a test for you as a follower. God knows that money is a strong and effective indicator of the condition of your heart. So much of the resources we spend are slippery. They’re spent on things that will be broken, consumed, experienced, expired, and cast aside. The investment of the tithe is sure. And the reason it is sure is that it is eternal. None of us will bring our cars, our homes, our 401ks, our boats, our jewels or our food into Heaven, but our tithe is a different story all together. We are investing in a kingdom that is built to last. And last FOREVER. The calculations of compounding interest over 30 years are quite impressive to most people. Can you get your brain around compounded interest over 30,000 years? The lives that are saved, the movements that are started, the resources that are provided are used to do eternal things. There is no greater investment than the investment in eternity! When you open yourself up to giving through the tithe you get a glimpse into the supernatural. 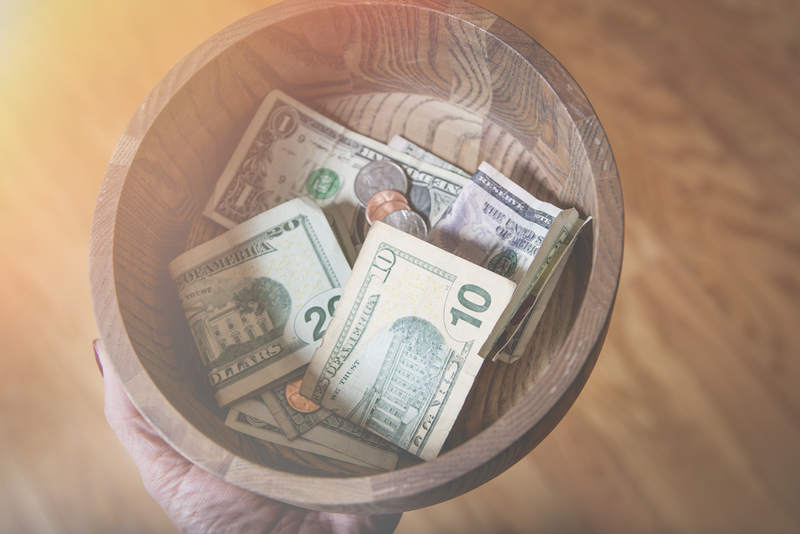 Ask the tither if supernatural provision has ever happened in their years of giving, and inevitable the answer is, “Yes.” For some reason, God rewards the tither with a glimpse of the supernatural. Sorry, but the accountant in me had to point out this minor little benefit! It’s true, tithing is an illogical risk, but it strengthens your faith muscles. The more you tithe, the more God shows up, the more you trust, and the more you are willing to do things that are beautifully unsafe. Once you begin to trust your money to God, you’ll find it easier to trust him with everything else in your life. The givers are the happiest people on the face of the earth. There’s a certain deep feeling of bliss that comes from giving with no regard for receiving. We realize that it wasn’t ours in the first place and so money takes on a transcendent meaning that can’t be found in wealth accumulation. Once tithers experience God in giving, we want to share with others about the grace and provision God has provided us. We share the joy of giving and God’s graciousness to us and others are inspired to give. One of the most debilitating characteristics of unhappy people is greed. Like generosity, greed can go viral. And when we feed the greed, it spills over into every area of our lives. Last, but not least, we give because it’s a biblical principle and promise. Here are a few excerpts from the tithing narrative that God threaded throughout his Word. Here are just of few of the promises God gives in His Word regarding tithes and offerings.